We had applied for disconnection of the above telephone nos. vide our letter dated:: 25.01.2018 and received by BSNL, M G Road Place office on 30.01.2018 – copy of the letter is duly enclosed. Against our said application the telephone lines have been disconnected. In this respect as per the instructions received from your BSNL, M G Road Place office we are surrendering the telephone sets – 2 Nos for completion of disconnection formalities related to said telephone lines. We had already made payment against the above telephone nos. for the period from 01.01.2018 to 31.01.2018. Copy of the telephone bills and receipt is duly enclosed. Please accept the 2 Nos. 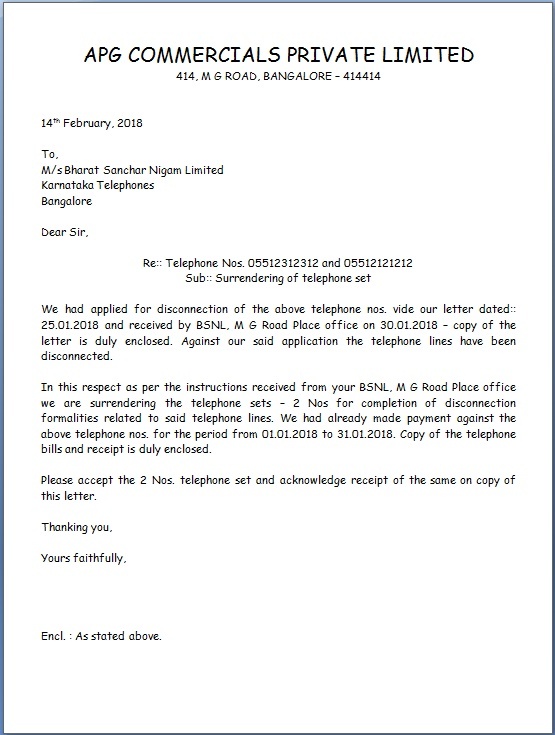 telephone set and acknowledge receipt of the same on copy of this letter. Encl. : As stated above.